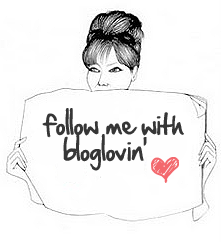 Hi everyone, I hope this blog post finds you all well. Guess what?!?! It’s my turn to host The Home Bakers (THB) #16 bake from the book Coffee Cakes by Lou Seibert Pappas – hooray!!! For those of you who do not know of THB, the group was set up by Joyce of Kitchen Flavours. We all own the same book and each month we all share our delicious baking experience of the same recipe selected by the host of a particular recipe. Anyone can join in, just send an email to Joyce and start baking with us. So *happy baking dance* I will be your host this time round. As the host, I could select a recipe that was still available and post the recipe here to share with you all. For those of you who have been following my baking experiences with THB, you will know that only the host can state the recipe. As I love rosemary, the Rosemary-Lemon Polenta Cake caught my eye as I was flicking through the book trying to select a recipe for this host bake. At the time I had also never baked a cake with polenta being one of the ingredients so it was also going to be a bit of a challenge (since selecting the recipe back in August last year I have baked with polenta here). I didn’t really read the entire recipe till after I had already sent Joyce the email confirming my recipe of choice. I realised that there was a bit more to this cake then the usual – a bit of chopping, squeezing & syrup making – ahhhhh!!!! (yes I get lazy when it comes to extra things to be done). But being the diligent baker I am I soldiered on following the recipe step by step and was rewarded greatly. Preheat the oven to 180°C or 350°F. 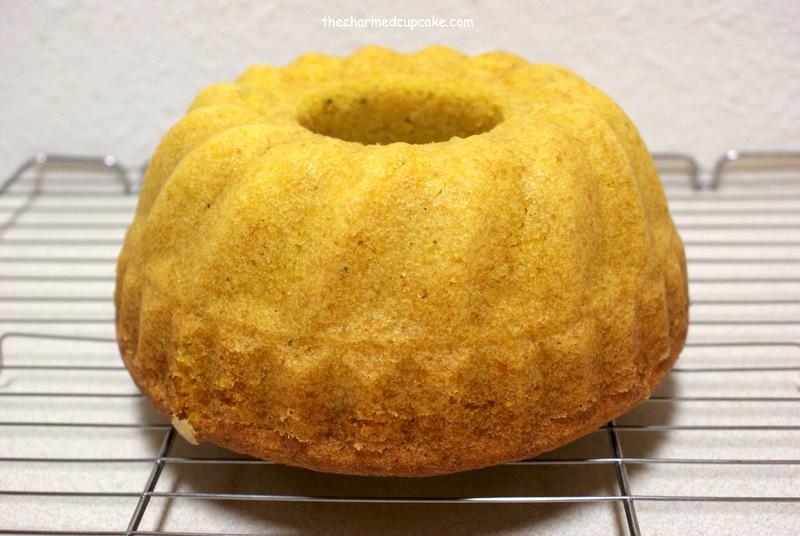 Butter and flour a 10-inch Bundt or tube pan. In a small saucepan, combine the buttermilk and rosemary or lavender. Heat over low heat until bubbles form around the edges of the pan. Pour over the polenta or cornmeal (I strained it so that there was not a whole forest of rosemary in the mixture) in a small bowl, let stand for 1 hour to soften. In a large bowl, beat the butter and sugar with a wooden spoon or an electric mixer until light and fluffy. Add the eggs, lemon zest, and vanilla and beat until blended. In a medium bowl, combine the flour, baking powder, baking soda, and salt. Stir to blend. Add the dry ingredients to the butter mixture alternately with the buttermilk mixture in 2 increments, mixing until combine. Add the batter to the prepared pan and smooth the top. 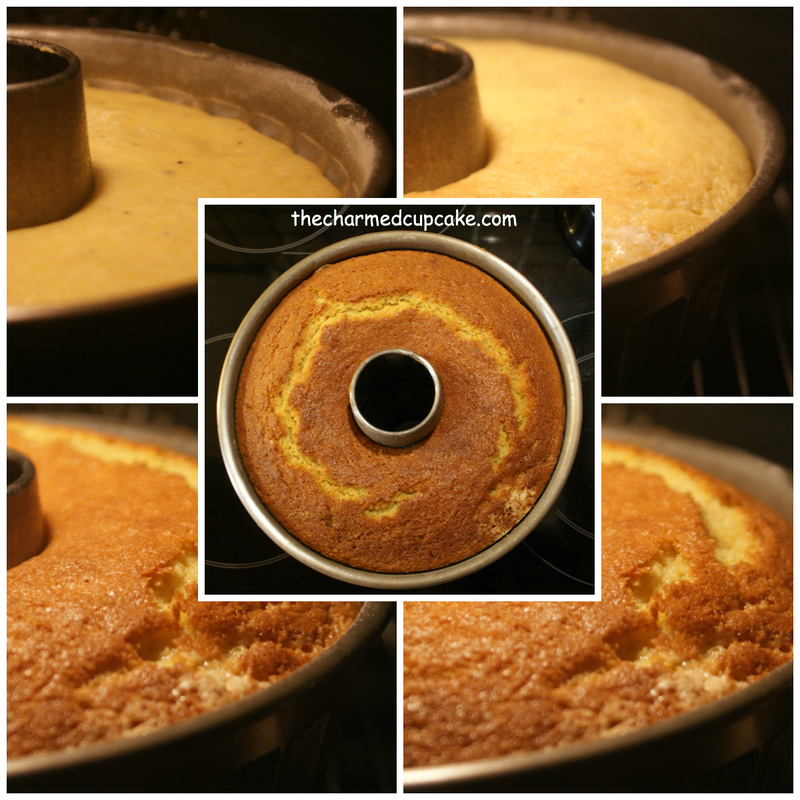 Bake for 50 minutes, or until the cake is golden brown and a cake tester inserted in the centre comes out clean. Meanwhile, make the rosemary-lemon syrup. In a small saucepan, combine the sugar, lemon juice, water, and rosemary or lavender. Bring to a simmer over low heat and cook for 5 minutes. Remove from the heat and stir briefly. Let cool for 30 minutes and strain through a fine meshed sieve. 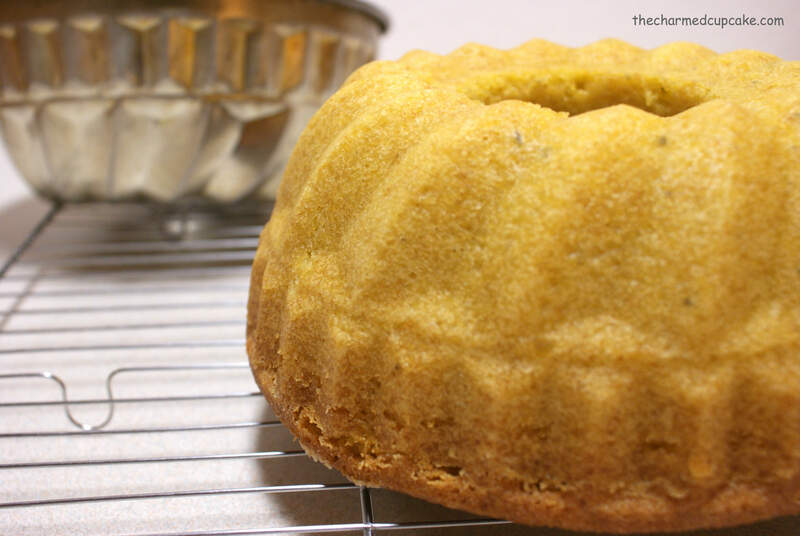 Let the cake cool in the pan for 10 minutes. Unmould right side up on a wire rack. While the cake is still warm, drizzle it with the syrup. Cut into slices to serve. 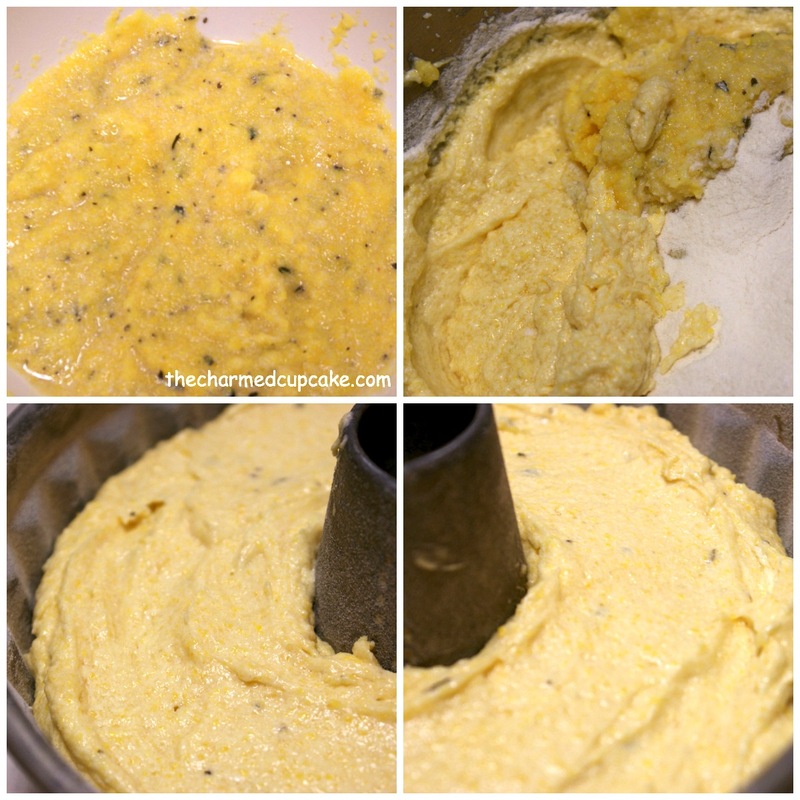 Top left: Polenta mixed with boiled buttermilk and rosemary. As you can see I strained the buttermilk and rosemary so that the polenta mixture would not have so much rosemary bits. This cake is for sure only imbued with a hint of rosemary. From the amount of rosemary, I thought that the flavour would be overpowering but quite the contrary. 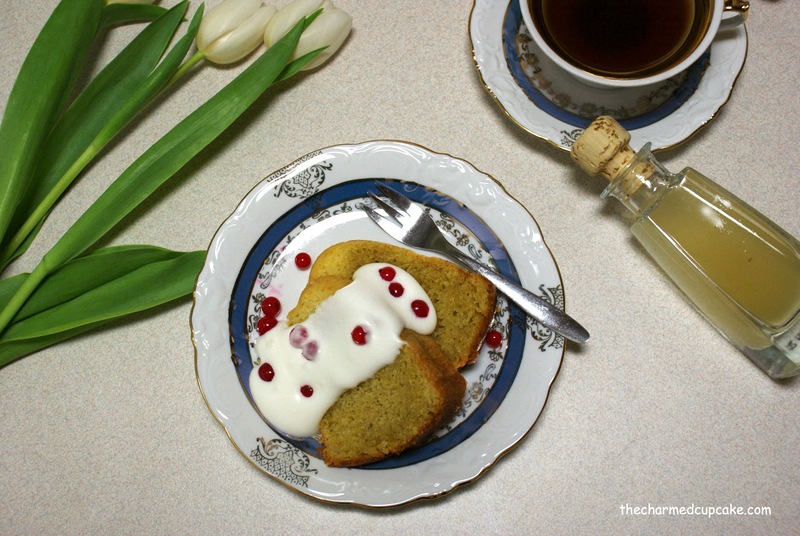 I served it for afternoon tea to my guests and we enjoyed it as an afternoon tea/dessert with cream and red currents accompanied with rosemary-lemon tea. As I sliced the cake I noticed that at random sections the cake had a two-toned colour effect, I think this was caused by the syrup being drizzled/spooned over whilst it was still warm. As you can see the top layer was moist and not so ‘dry’ compared to the center of the cake. This cake was certainly not dry at all, but the syrup did make it more moist. If I was to make this cake again I would poke holes before turning the cake out and pour some syrup in whilst it’s still in the tin then poke & pour more syrup again when it is turned out. But with all that said this cake was just as delicious without the syrup. You can also see that I only added a bit of rosemary and not all as stated in the original recipe otherwise there would be a whole forest of rosemary in the cake which might not suit a lot of people. My guests were oblivious to the fact that there was polenta in the cake. There was the slight crunch from the polenta but the texture was overall like a beautiful fluffy buttercake. 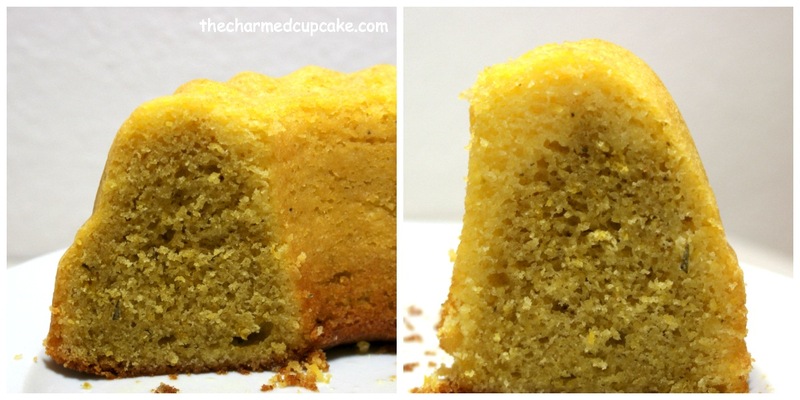 This cake was deliciously moist, even without the syrup. More than two helpings were requested so this cake was eaten in no time, my guests thoroughly enjoyed it. However if you don’t like a strong lemon flavour then I suggest you omit the syrup or serve it on the side. I hope you enjoyed this bake and please do join us over at THB if you can. Also be sure to check out my fellow THB members to see how they went with this scrumptious bake. Aw yum!!! What a gorgeous, fresh and delicious recipe. Love the combination of the lemon with fragrant rosemary… I’m becoming obsessed with herb and fruit pairings at the moment! I made a flourless orange and almond cake a couple of weeks ago with rose petal and lavender syrup. Worked so beautifully… rosemary would definitely work as a worthy substitute. Yum!! I finally got to make this and yeah, we liked it. Thanks for selecting it. Love the flavour combination here -it looks and sounds amazing! Hope you had a good Easter. I would love to try to do this with rosemary again. Its a great recipe you have picked, Angela! Thanks for picking this recipe. It was delish! 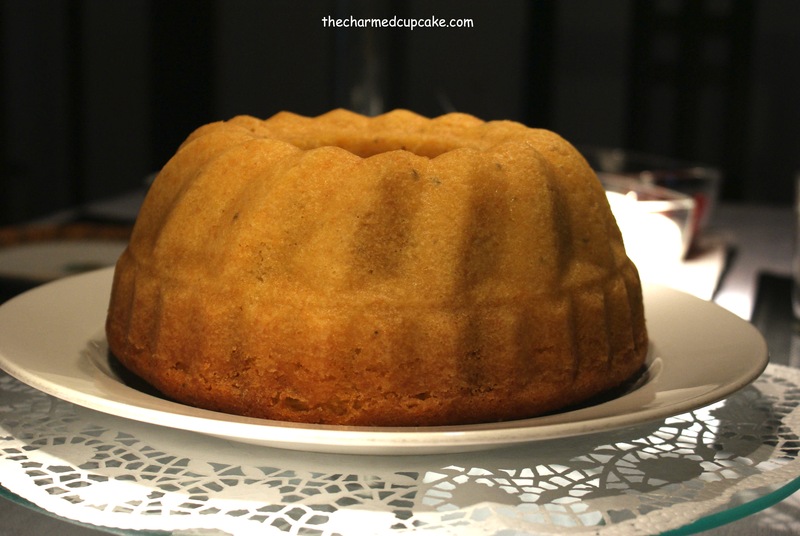 Angela, your bundt cake looks picture perfect 🙂 Glad you chose this cake as it depicts a pound-cake like texture but yet moist and it goes so well with a cuppa tea or coffee. Have an awesome easter! thanks for the lovely comment. 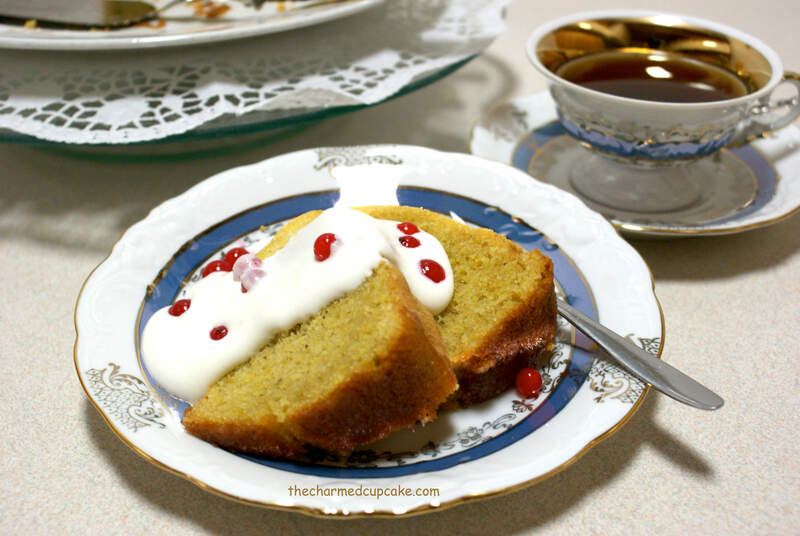 I am sure you would love this cake if you baked it, it’s really a lovely afternoon tea cake. Wishing you a lovely Easter too. Your cake looks wonderful! You’ve picked a great choice, this cake is really moist and I’ve enjoyed it with a cup of warm tea. I’ve made mine using lavender and would love to try it with rosemary. I can see what you meant by the two-colour toned, yes, probably from the rosemary syrup, but then it adds a nice look to the sliced cake! Now am eager to see which flavours the others have made! Hi Joyce, I really enjoyed this cake. The combination of the rosemary and lemon takes me to a lovely warm mediterranean setting out in a warm shady garden 😉 I’m sure the lavender and lemon combination was just as wonderful. 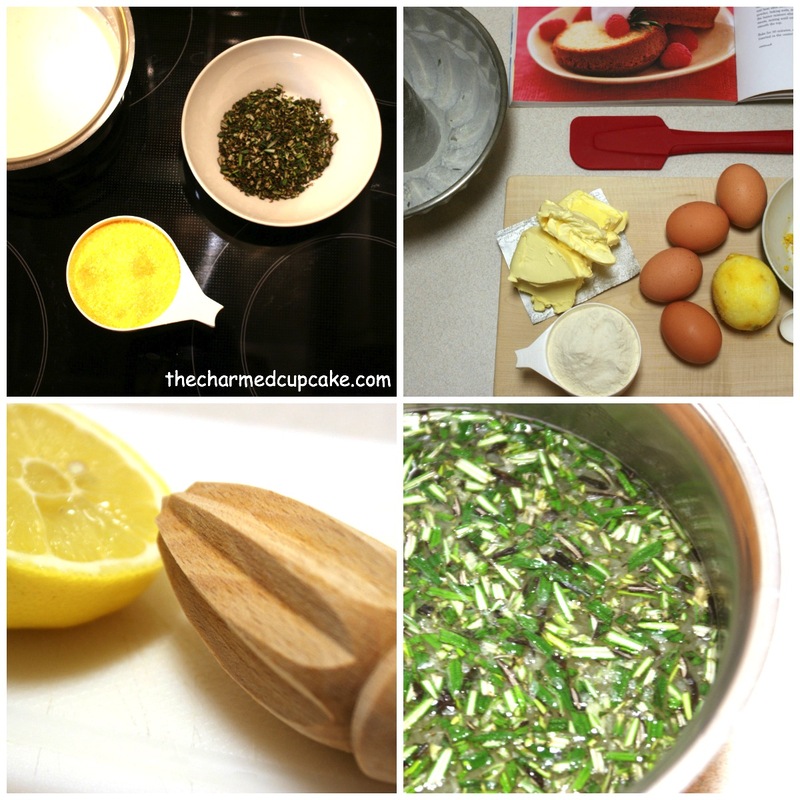 Would love to know what you think of the rosemary and lemon combination when you try it.